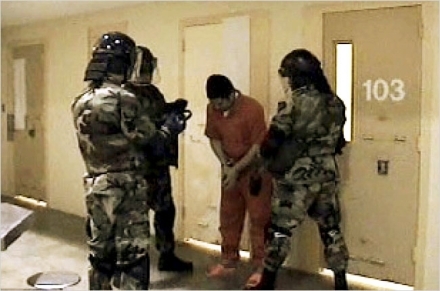 "One spring day during his three and a half years as an enemy combatant," the New York Times reports, "Jose Padilla experienced a break from the monotony of his solitary confinement in a bare cell in the brig at the Naval Weapons Station in Charleston, S.C."
Padilla was taken to the dentist that day and for whatever reason, his trip was videotaped. That tape is one of the few glimpses into his incarceration. Padilla, an American citizen, was accused of plotting a dirty bomb attack but was not charged (his status has since been changed to criminal defendant and he awaits trial on other, lesser charges). He was held for 21 months without seeing a lawyer. His interrogations included "hooding, stress positions, assaults, threats of imminent execution and the administration of 'truth serums'," according to his lawyers. His lawyers also say he was "held alone in a 10-cell wing of the brig; that he had little human contact other than with his interrogators; that his cell was electronically monitored and his meals were passed to him through a slot in the door; that windows were blackened, and there was no clock or calendar; and that he slept on a steel platform after a foam mattress was taken from him, along with his copy of the Koran, 'as part of an interrogation plan'". This is how they treat American citizens. How do you suppose they treat everyone else? What if one day they "detain" you or me? You should really put on a fair and balanced view.not those comments that suit your argument. Perhaps your right..they should just let him go on his business. Its a shame that such an intriging Website about bringing Hamilton back to life has to be littered with such extreme left wing commentary about world views. Genghis wrote: "This is how they treat Americans trying to build a dirty Bomb." Has he been charged with anything? Has he stood trial? Has he had access to a lawyer? Has he had the right of habeas corpus, which was established a thousand years ago? Also: "Perhaps your right..they should just let him go on his business." This is a straw man attack. No one is saying he should simply be let go. However, if the US government thinks he has committed a crime, he needs to be charged with a crime, and he needs to stand trial in an open court with the right to make a defence. Instead, he was detained in isolation for more than a year and a half without ever being charged with anything. Since when is it "extreme left wing" to expect that a liberal democracy should follow the rule of law? What is "extreme left wing" about upholding the Constitution and granting people basic civil rights that were established in common law over a thousand years? The argument that Padilla deserves to be charged with a crime and to defend himself in a court of law without being unnecessarily or unreasonably detained is profoundly conservative - it is the core foundation upon which the law rests, and it is couched in a healthy, conservative disregard for arbitrary and authoritarian abuse of power. It's a deep shame that so many conservatives are cleaving themselves along partisan lines rather than the philosophical underpinnings of conservatism, which are based in respect for traditions, common law, and restraint in the exercise of power.